Among the various benefits offered to our men and women who have served in the military, the Illinois VA loan is a real gem. This program has empowered thousands and thousands of people with the ability to buy a home and secure a place in their respective communities. 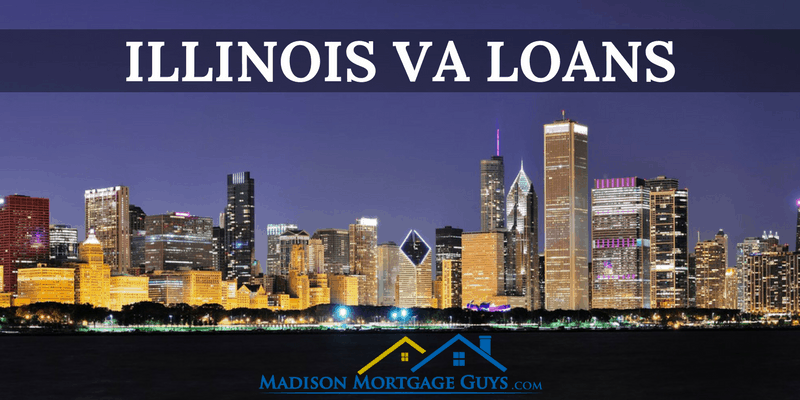 There are a handful of benefits that come with the Illinois VA loan that distinguishes it from other types of mortgage loans. There are a lot of excellent programs available to help people buy a home with a small down payment. However, the Illinois VA loan does not require any down payment for qualified borrowers. This one major feature gives a veteran the chance to buy a home and potentially save thousands of dollars when compared to the 3% to 5% down payment requirement of other types of loans. Loans that allow borrowers to buy a home with a down payment less than 20% of the asking price will charge a monthly premium known as Private Mortgage Insurance or PMI. This premium is designed to protect the lender in case the homeowner is not able to make all the payments on the loan. In contrast, the VA loan does not ask borrowers to pay PMI. When combined with the no down payment feature, it is obvious that qualified veterans can save a lot of money using the Illinois VA loan to purchase a home. This is only a partial list of the various people involved in a mortgage. To aid the veteran, the federal government places a cap on the amount of each item that can be charged. Each kind of mortgage has a set of guidelines that determine who can be approved for the loan. The Veteran’s Administration oversees these guidelines, but it does not lend money directly to the borrowers. Instead, it approves banks, credit unions, and mortgage brokers to offer the VA home loan. Listed below are descriptions of the basic guidelines for the Illinois VA loan. The Veteran’s Administration has differing requirement of length of service based on wartime or peacetime. In addition, people that have served in the Reserves and/or National Guard may be eligible. Here is a brief breakdown of the service requirements. Once you have determined that you have met the service requirement you may take the form DD-214 to a lender of your choice. The lender will use that form and apply online for your Certificate of Eligibility. Multi-unit property. This can be a duplex or even a 4-plex. The main requirement is that the qualifying borrower must live in one of the units as their primary residence. Any type of property that is zoned as commercial is not allowed for the VA mortgage. Investment or rental properties are also not allowed. One of the main document requirements of the Illinois VA loan is proving your annual income. Generally speaking, people use one of the following methods to document their income. For people that do not own a business, the most recent pay stubs documenting your income from the last 60 days, along with the last 2 years’ w-2 forms should be sufficient. If your income comes from some other type of source, such as disability payments or investment income, you will need to document your income by providing bank statements showing where the money is coming from for the last 2 years as well as personal tax returns. The Illinois VA loan has enjoyed some of the lowest foreclosure rates since its inception primarily for one reason; the residual income rule. This rule was put in place to ensure that the veteran would have money left over each month to cover not only basic necessities but a few luxuries from time to time. The amount of residual income necessary to get approved for the loan will depend on the yearly income for all borrowers, the amount of monthly debt payments and the number of people living in the home. The Illinois VA mortgage program is known for approving borrowers with less than perfect credit scores. So long as the borrower has made all of their debt payments on time for the past 12 to 24 months, they stand a good chance of getting approved for the loan. If you have time before you purchase, improving your credit score is something to consider. Most mortgages come in different varieties and the VA loan is no exception. Each one has advantages that will pertain to certain circumstances. The fixed interest loan is the exact opposite of the ARM. The rate that is used when the loan is closed will never change during the life of the loan. People who intend to remain at one location for many years are usually the best candidate for a fixed rate mortgage. As the name implies, the hybrid is a mix between two loan types. It is usually described as a fixed rate ARM (ARM is an acronym for Adjustable Rate Mortgage). This means that the first portion of the loan will use a fixed interest rate while the remainder of the loan will have an adjustable rate. For example, a 5-year ARM would have a fixed interest rate for the first 5 years of the mortgage. At the end of the 5 years, the rate would adjust each year until the end of the loan term. Most adjustable rate loans have a ceiling for how much the rate can change per year and how much the rate can change over the life of the loan. Regardless of credit, income, or location, getting a mortgage can take some time. Recent reports show that from pre-qualification to actual loan closing, it can take as long as 30 days to get a loan. For this reason, the VA program has a speedy refinance option. It is a great way to get a lower interest rate without the typical paperwork and time involvement of a usual VA mortgage. Must currently have a VA mortgage. The program is not available for other types of home loans. The borrower must be on time for the most recent mortgage payment. The last 12 mortgage payments must be on time payments. No late payments allowed. The focus of the IRRRL is to help an existing veteran lower their rate on their current mortgage. Therefore, it is not necessary to prove their income, determine the value of the home or perform a credit check. Even if the home’s current market value is below the mortgage balance, qualifying veterans can still apply for an IRRRL. People who have experience in the military know that it is common to get transferred around from base to base. In a situation in which a person has already used their certificate of eligibility to purchase a home near one base, they may keep that home and rent it out. They could then buy another home at the new location using the VA mortgage. It is important to note that qualified veterans are limited to the purchase price of a home by their eligibility certification. Since they will have one home using part of the eligibility, you can see where the 2nd home’s price would be limited since the overall eligibility is reduced. In this situation, it is best to speak with a mortgage lender and find out the maximum amount to which you can qualify for the 2nd home. If a qualifying veteran does not use all of their eligibility when they buy their home, it is possible to have a remainder of eligibility that can be used after a person has a home foreclosed. Here is a walkthrough of one example. People that have served on active duty or in the reserves should contact a mortgage lender and ask about the Illinois VA mortgage as they are preparing to purchase a home. The ability to buy a home without the requirement for a large down payment, and the forgiving credit requirements, make it a great way to obtain home ownership status.